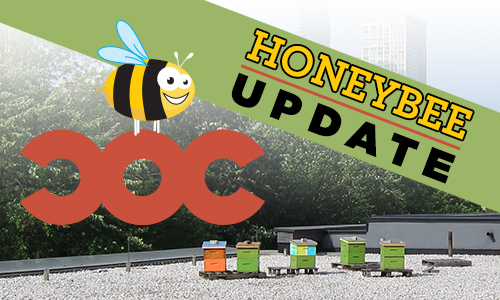 It's suddenly summer in Toronto, and the COC's honeybees were recently returned to the roof of the Four Seasons Centre for the Performing Arts by beekeeper Fred Davis, after being wrapped up well in their winter quarters. Fred reports that the hives did really well over the winter, with the loss of only one hive, which is really good. Five full hives and two smaller ones will be active on the roof under the guidance of Fred and his two assistants, Catherine Jordan and Vivien Wong. It’s been a while since we’ve reported on the honeybees that live on the roof of the Four Seasons Centre for the Performing Arts, but that doesn’t mean they haven’t been as busy—really, really busy. All that hard work has paid off and it’s official: COC bees produce the best honey! Fred Davis, beekeeper to the hundreds of thousands of bees who live on our roof, entered this season’s harvest into the Royal Agricultural Winter Fair amber honey competition. The honey took first prize, with a score of 96 points out of a possible 100! The honeybees that live on the roof of the Four Seasons Centre for the Performing Arts have a great view, but they’re probably too busy to notice it. Beekeeper Fred Davis reports that about 150 pounds of honey have been collected so far from the Four Seasons Centre hives. One thing he’s noticed is that the honey that has been produced this year is darker and this indicates that it's gathered more from flowering trees and bushes and less from flowers. This same darker honey is being gathered from other downtown Toronto hives as well.